I would wire the livewell lights to a different circuit than the pump run wire , like the anchor light switch or a dedicated one. You’ll not need it to be on except when the anchor light is on at least. The bilge pumps, I like an over ride switch to bypass the float switches for a manual run. Ive had a float switch fail open and bypass switch came in handy. I use a three way auto off on switch on mine but you could leave the float switches wired straight to the house battery and still install a manual run switch. Last edited by Dacman; 03-10-2019 at 01:10 PM. I am confused by running the negative from the starting battery to the negative bus bar and running the return from the engine back through it. Unless I am missing something you have tied the negatives of the batteries together but not the positives. I'll ask my DC engineer but I always thought this was frowned on. I may be off in this, but I'd run the return from that engine right back to the battery and not through the negative bus bar. Great job on documenting all of this, will make life so much easier later when you are trouble shooting future issues. Very well thought out as well. Good luck with your build. I am confused by running the negative from the starting battery to the negative bus bar and running the return from the engine back through it. Unless I am missing something you have tied the negatives of the batteries together but not the positives. I'll ask my DC engineer but I always thought this was frowned on. Negatives of all batteries should be common - 'tied together'. Positives are only 'tied together' when intended to be "paralleled". with that "100 amp bus bar". not the 5/16" or 3/8" typically used for main battery cables. I just returned the 100a busbar and got a 1/4" post 130a bus bar. 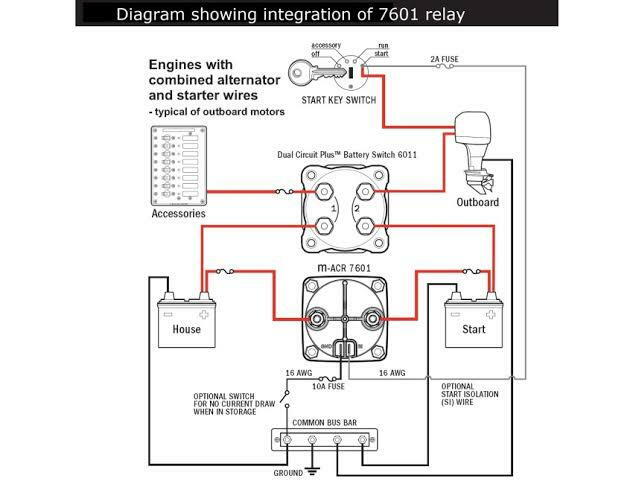 Should I reroute negative from engine to starter battery and then common everything else to the busbar? That should take some of the load off of the busbar? and minimize the number of connections/contact surfaces. There's no single 'right' way. Now another factor is potentially using - in extremis - the house battery to crank. Then you also want a "big" negative connection from the house battery back to the engine. Are the two batteries going to be next to each other? and from there another (can be smaller) cable to the negative bus. Batteries are right next to each other in console. I'm trying to get a solid plan together but there are so many ways to skin a cat so to speak. I had my old boat wired the way you are saying and it worked great, however I had a guy come aboard and told me everything should be grounded to a bus bar and go to respective units from there. I like your way as it cleans things up and makes it simple with the busbar. One #4 to the bus bar from house battery sounds better than 4 #4's and a few #8s. On blue sea diagrams they show everything going to bus bar so I was just going to connect dots the way they have it pictured. But in theory both ways would be completely fine...right? Ja, es läuft mir auch im Blut! Forget running engine negative/starter through bus bar and follow surfspear advice; run dedicated cable to engine with jumper between batteries negative terminals. Cable is expensive but bus bar is higher resistance and potential failure point and battery cable lug will use too much space at bus bar. Jajaja! Deutsches Blut = mehr Arbeit! Meine Mutter spricht fließend Deutsch, aber ich muss ein bisschen schummeln ! For those of you that are interested I finished wiring today with the exception of the stereo kit I am waiting on. All in all it was a learning experience and a chance at a clean install. Here are a few pics and if you have any questions ask while it is all fresh in my mind. Thank you for all the help and advice. Still waiting on the breaker for fuse block to come in the mail as well. Will be going with blue sea 50a breaker. Gnrphil and Dacman like this. Thanks guys, it has been a fun project so far. Not cheap by any means but done correctly!